I don't know about you married folk out there, but the only time I wear my wedding ring at home is when I'm getting ready to head out there door. That heightened awareness and caution of first wearing it never wore off, and I'm afraid I'll get it caught on something. I'm probably a rare breed of female that feels more relaxed at home when I don't have to worry about it! Yeah, that was just an opportunity to post a photo of my ring, because I love it. Sue me. :-) That poor beauty just sits on my bathroom counter, tucked far into the corner so it won't fall in the sink, whenever I'm home. I finally conceded and gave it a proper "home" this weekend. 1. 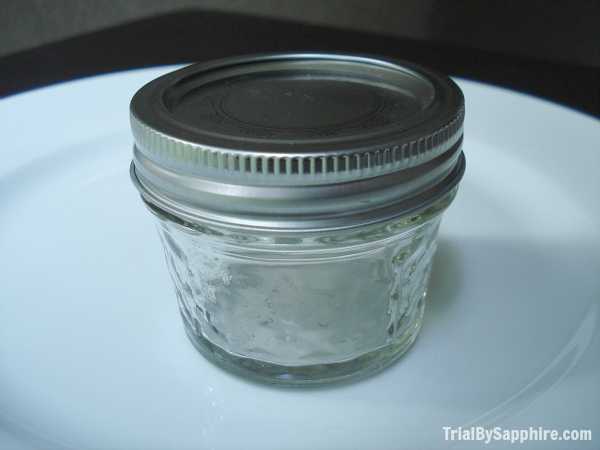 Clean your jar to remove any residue or dust. 2. Remove the two-piece lid. 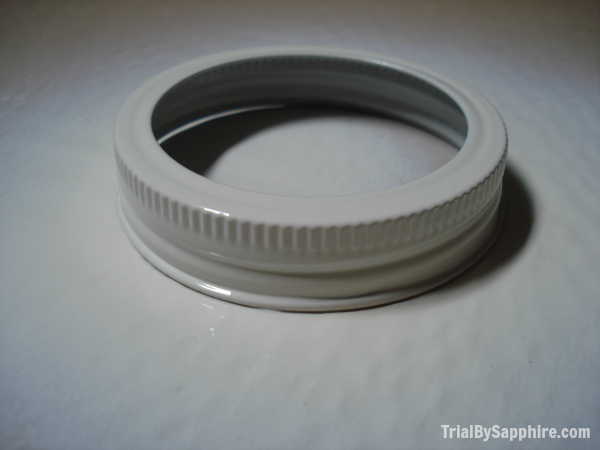 Flip the lid rim over and trace a circle on the back of your fabric using the inner circle, not the outside of the lid. 4. 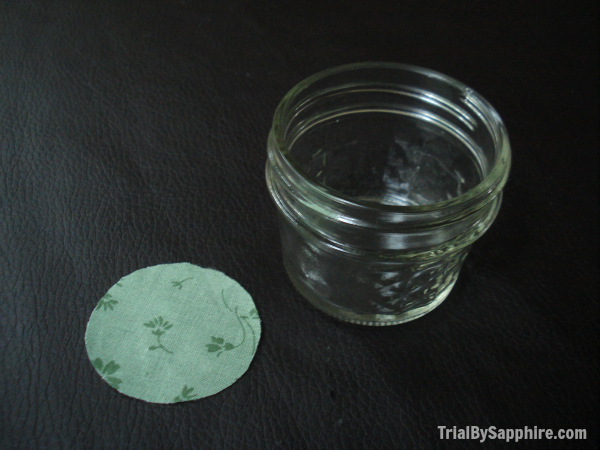 Using a hot glue gun, glue the fabric to the inside of the jar. 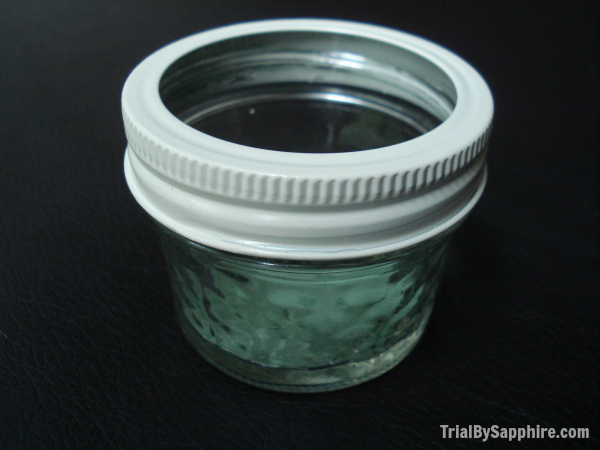 After the paint dries, screw the lid rim on the jar. 5. 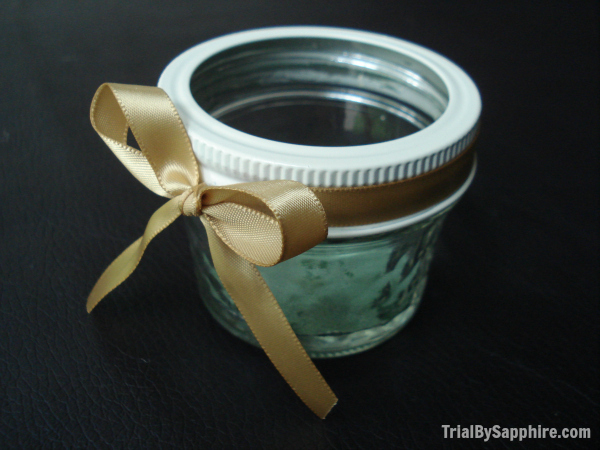 Tie your ribbon around the jar. Simple! My ring now has a soft and protected place to sleep at night (along with a few pairs of earrings)! I chose the fabric and ribbon to match the book box I keep my make-up in. 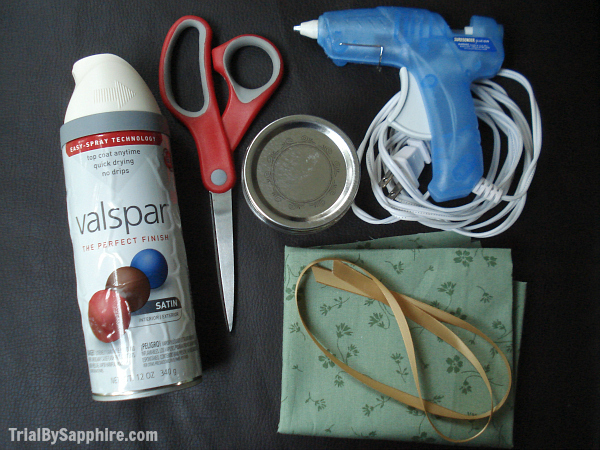 My weekend of full of crafting (well, for my standards), cooking, and sleeping. Bliss! Oh, and I also caught The Time Traveler's Wife at, like, midnight on Saturday and couldn't resist. I just sat there and let myself cry through the end. Such a girl! You're so clever! I rarely wear my engagement ring, and don't usually wear my wedding band except when we travel, but instead of having a clever spot for them or even putting them in the cheap-o jewelry box I've had for years, they are usually on the side table, fallen behind the headboard, in a drawer, in the bottom of my purse... you get the picture. I should make a cute jar like you did!! Your ring is gorgeous, btw!! I never take them off for the exact opposite reason... I feel more protected when they are on my person. Weird how that works!! Glad you found a SUPER cute solution to your "please dont fall in the sink" problem! So smart and simple! I think I could use something like this for my earrings :) and your ring is so beautiful! This is such a cute idea! I never wear my ring at home. If I'm honest, a lot of times I forget it when I walk out the door too. I'm pretty clumsy and have "lost" it twice so I just don't trust myself. 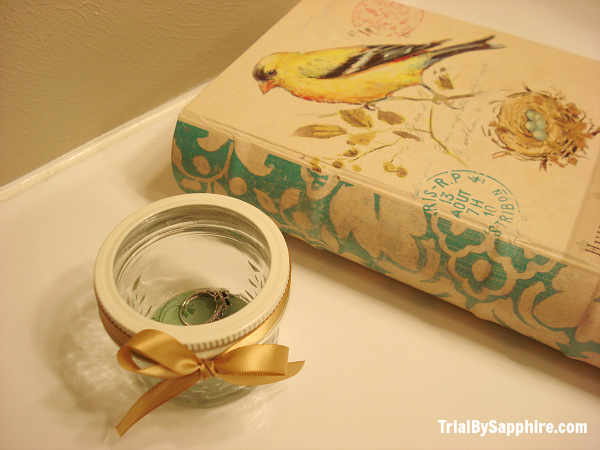 I LOVE the idea of storing makeup in a book box, btw! It's so cute! So cute! I actually had the lady at the jewelry store basically tell me to never wear my ring. She gave me a huge list of no-no's when wearing the ring. I don't know how some people never take theirs off! I'm way too clumsy for that! I still never ever take off my engagement ring...maybe because it's new but I feel way too naked without it now. Hahaha. Stop it. This is brilliant!! And I'm just like you, I never wear my rings at home. I don't want to get them icky when I do dishes and stuff and I just feel more relaxed when they're not on. AND this is even more perfect because my cat likes to play hockey with my rings if I don't hide them well. Cute idea, and your ring is beautiful! So unique, I really love it! sooooo cute! this post couldn't have come at a more perfect time ;) must make one! I totally do not wear my diamond at home. I always keep my band on (its just a simple platinum band) but I only wear the diamond when I go out too! very cute. I keep my ring on at all times except while doing dishes or showering. I'm freaked out if it's not on because I worry I'll lose it. And when I take it off, I think of every bad possibility (drains, toilets, floor air vents) so this would be good for those situations! 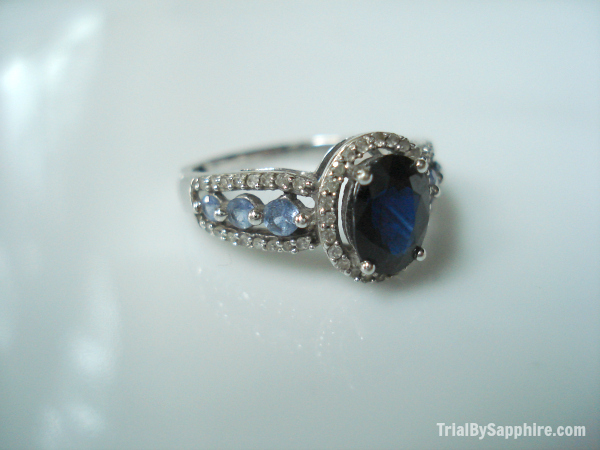 The catch-all is a great idea for your ring, it turned out so cute! I take my rings off the minute I come in the door too. I only wear them when I'm not home, you're definitely not the only one! By the way, your ring is gorgeous and so unique! I never take off my engagement ring. It's on my finger all the time unless I'm showering, and then it goes right back on. When Brian and I first got engaged, I didn't wear it much. I took it off unless I was sitting on the couch because I didn't want it to get messed up. Then one day I decided I wanted to stop taking it off, it was so special to me, and if it gets scratched or whatever, it's just adds character and love. That was a year ago. Now I feel naked without it on. I probably won't take my wedding bands off when we get married either. This is adorable + I definitely need to get my jewelry organized! This is such a good idea. I am forever losing my rings. Also... I think I just realised the meaning of your blog title?